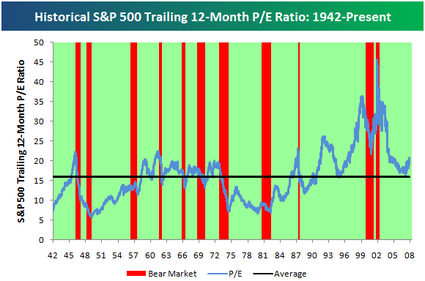 For those interested, below we highlight the historical trailing 12-month P/E ratio of the S&P 500 since 1942. The green and red shading represents bull and bear markets of the S&P 500. 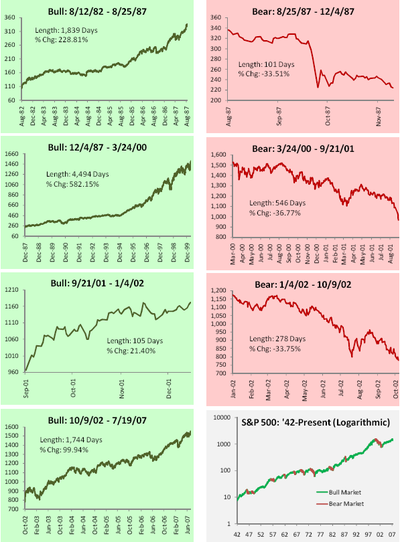 Bull markets are rallies of 20% that were preceded by a decline of 20% and vice versa for bear markets. Generally you see P/E expansion during bull markets and P/E contraction during bear markets. However, the most recent bull market saw P/Es contract from high levels, and during the recent correction, P/Es have expanded. The current trailing 12-month P/E of the index is 20.5 versus an average of 15.90 since 1942. Subscribe to Bespoke Premium to receive more in-depth research from Bespoke. 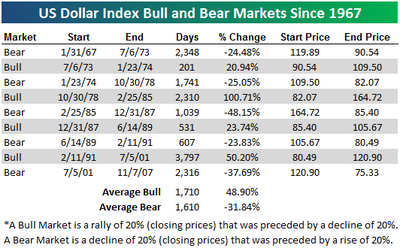 With the US Dollar index falling even lower today, below we highlight the historical bull and bear markets of the currency. As shown, market cycles for the currency are longer than some of the other asset classes that we have looked at. 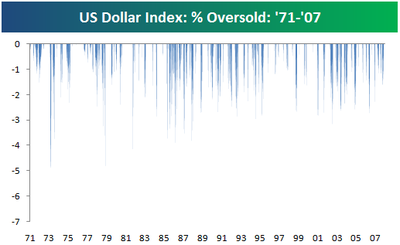 The average bull market for the US Dollar is 1,710 days long for an average gain of 48.90%. The average bear market is 1,610 days for an average decline of 31.84%. 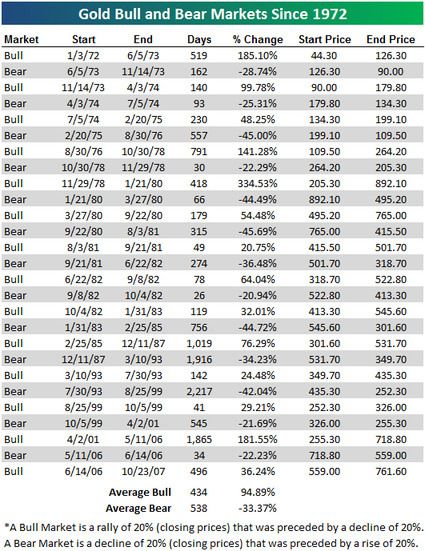 Based on these averages, the current bear market is both longer in duration and more extreme in its decline. Since the current bear market in the US Dollar started in July 2001, currency has declined 37.69%. 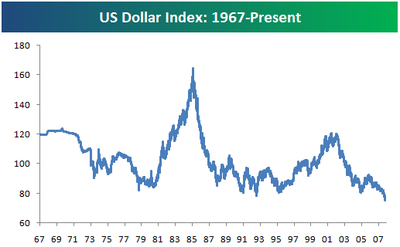 Below we highlight a historical price chart of the US Dollar index. As shown, we're currently at record lows. However, the currency isn't nearly as oversold as it has been in the past based on its distance from its 50-day moving average. Currently, the US Dollar is 2.25% below the bottom of it trading range. As highlighted in the second chart below, the Dollar has reached oversold levels of 3% to 4% quite frequently. For our next Bespoke Reference post, below we highlight the historical bull and bear markets for Gold since 1972 (post Bretton Woods). 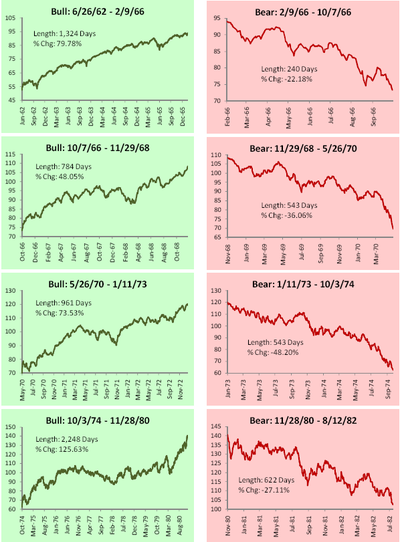 Since '72, there have been 14 bull and 13 bear market cycles (20% rises/declines preceded by a 20% decline/rise). The average bull market in Gold has lasted 434 days with gains of 94.89%. 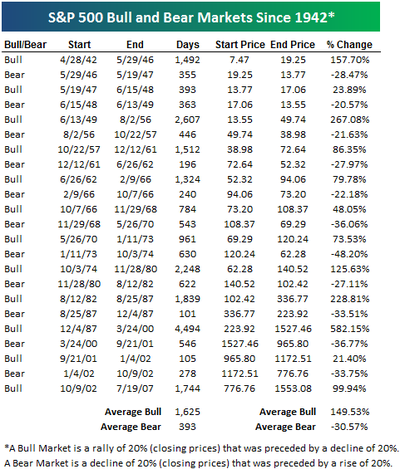 The average bear is a bit longer at 538 days with average declines of 33.37%. The current bull market in Gold that started in June of 2006 is a bit longer than the average at 496 days with gains of 36.24%. 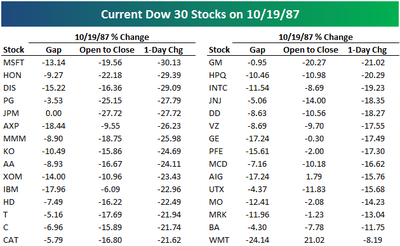 As a reference post and for a little perspective, we highlight the performance of the current Dow stocks (not the 30 in the index at the time) on Black Monday, 10/19/1987. As shown, MSFT fell the most at -30.13%, followed by HON (-29.39%) and DIS (-29.09%). The stock that opened down the most was WMT at -24.14%, but it also went up the most from the open to the close at 21.02%. 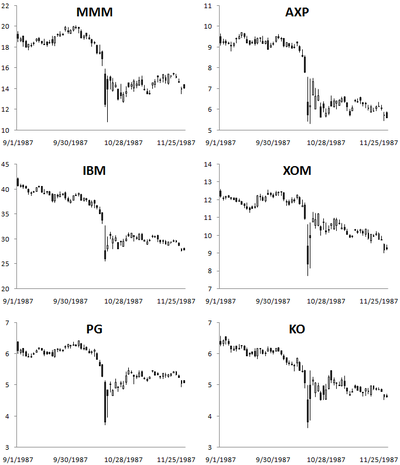 WMT was also the only current Dow 30 stock that didn't fall more than 10%. We also show six charts to highlight the trading action on and around the '87 crash. 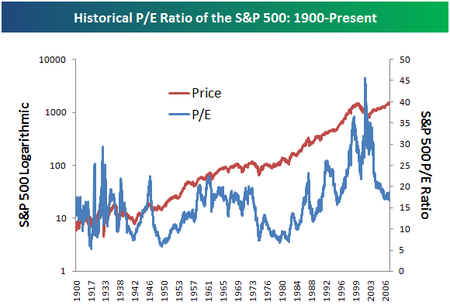 Earlier this morning we highlighted the historical p/e ratio of the S&P 500. Below we provide the historical dividend yield of the index as well. From the first part of the 20th century through about 1980, the yield was in the 3% to 6% range. The technological revolution of the 80s and 90s brought about a change in the makeup of the index, causing its yield to decline. Currently, the yield on the index is about 1.9%, still low by historical standards, but well above the historical low of 1.07% set in August 2000. Below we highlight a chart of the the price to earnings ratio of the S&P 500 (as reported earnings) since 1900. We also provide a logarithmic chart of the actual index price for comparisons. As shown, the late 1990s saw the highest p/e levels in history, and the earnings growth of this bull market has brought it back in line with historical readings. Currently, the p/e ratio of the index is about 17.5. The average since 1900 is 15.73. 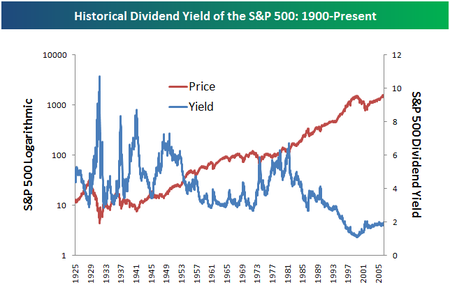 Later today we'll highlight the historical dividend yield of the index, so be sure to check back if you're interested. 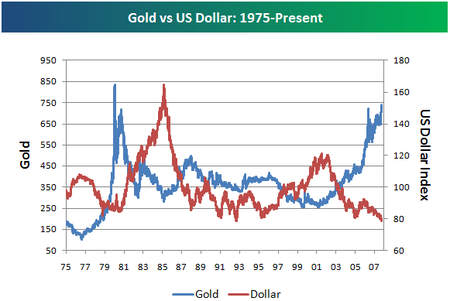 With Gold making 52-week highs on a daily basis and the US Dollar making 52-week lows, below we highlight a chart of the two going back to 1975. As the chart shows, the two move in the opposite direction of each other most of the time. Gold made its all time high of just under $850 back in January 1980 only to quickly reverse and move sharply lower. 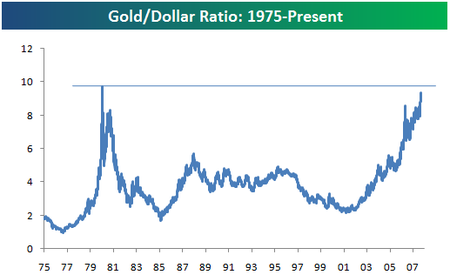 While Gold currently remains about $100 below its all-time highs, the ratio of Gold versus the US Dollar index is much closer to all time highs (2nd chart below). Most people seem to believe Gold will continue higher and the Dollar will go lower, but contrarians have a pretty compelling case based on these charts as well. As another post for our Bespoke Reference category, below we highlight a historical chart of the Federal Funds Rate since 1987 (the Discount Rate was used prior to 1987). 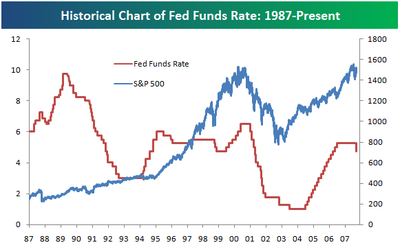 The blue line represents the S&P 500 while the red line represents the Federal Funds Rate (%). 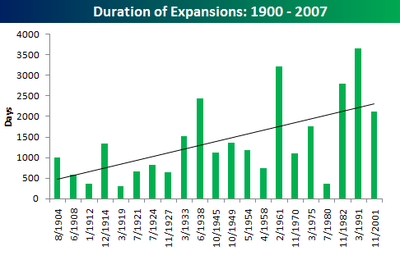 Now that more investors are beginning to talk recession, below we have graphically summarized US economic expansions and recessions since 1900 (red=recession, green=expansion). Click here to learn about Bespoke Money Management. As a new tool from Bespoke, we have added Bespoke Reference as a category on our site. These reports provide a historical perspective of the markets and the economy through charts and tables and are typically not readily available elsewhere online. 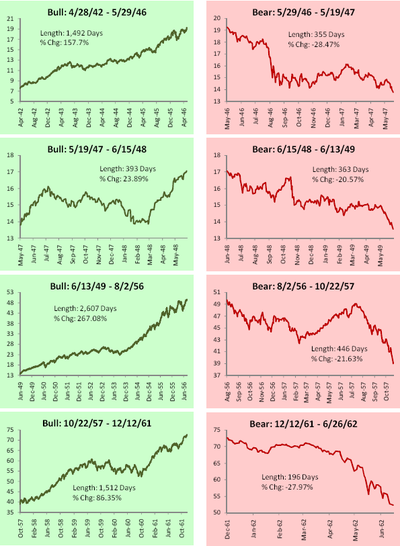 For our first Bespoke Reference report, we highlight historical bull and bear markets of the S&P 500 since 1945. A bull market is defined as a closing price rise of 20% that was preceded by a decline of 20%. 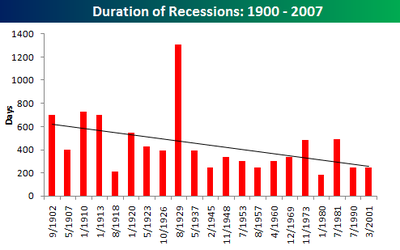 A bear market is defined as a closing price decline of 20% that was preceded by a rise of 20%. Since 1945, the average bull market has been 1,625 days with an average rise of 149.53%. The average bear market has been 393 days with an average decline of 30.57%. So the typical bull is long and strong, while the typical bear is short and nasty. Bespoke Premium members have access to PDFs and downloadable Excel files of all Bespoke Reference reports. For Bespoke's market thoughts and stock recommendations, visit our home page at www.bespokepremium.com.